I often joke that I use my master’s degree in Rhetoric and Professional Writing to “craft emails.” It’s funny because it implies that I’m wasting that expensive postgraduate education on something mundane, something that we all do a dozen times a day and that I certainly didn’t need additional schooling to learn. But in my opinion, writing emails IS a craft, one that so many professionals, especially in creative agencies, don’t spend enough time honing. A well-crafted email can save an account; at the very least, it assures your client that you’re on top of it. That they (and their investment) are in capable hands. Conversely, a poorly thought out message, even if it’s only intended to be transactional, can create confusion and open the project and the relationship up to failure. Whether it’s an email, a blog, or a webpage, when consuming digital content, people want to be able to scan. It’s just expected that electronic communication should be easy to digest, probably because we so often read it on our mobile devices while doing other things. Brief greeting: This could be a throwaway space, but don’t waste it. A short but relational statement that shows you remember past conversations, both personal and professional, goes a long way in establishing trust. Purpose statement: A clear signpost of why you’re emailing them. Details: The information they need to complete the task you’ve given them (the link to the file for review, a note saying the deliverable is attached, etc.). Next steps: Do you need feedback, and if so, by when? What kind of feedback are you looking for? Does a meeting need to be scheduled? Help them help you by laying out clear expectations for where things go from here. I send a lot of emails, and some of them are LONG. A predictable structure is one aspect of making a lengthy email easy to understand and respond to, but formatting within that structure is essential. With the simple addition of formatting, the client knows exactly where to look for each bit of info I lay out in my purpose statement, and they can quickly glean the most important points and take action. How does this read to you? On the surface, the message is simple and direct. But your client might take offense to what could be perceived as a curt tone. No pressure, but when it comes to written communication (digital or otherwise), word choice carries a lot of weight. Remember, you don’t have gestures, facial expressions, or tone of voice to mitigate or underscore your message. What might read to you like a good-humored joke could come across to a new client as snark. You might think you’re being brief and to the point; the client may hear annoyance. Avoid “like I said” phrases like “per my last email” or “as I said on our call.” They almost always come across as condescending and bothered. Don’t be afraid of a friendly exclamation point. The hard stop of a period can be a bit harsh sometimes, and simply switching it out for an exclamation point can change the way a sentence is read and received. Be nice. If you were talking to them in person, you would begin with some pleasantries and/or inquiries into how they are, and you would end with a warm goodbye. Do that in your emails, too. 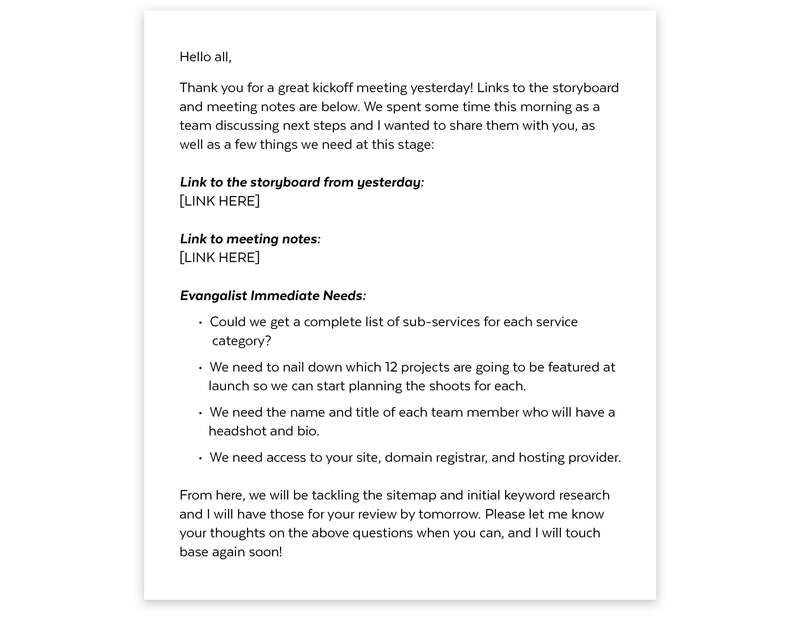 At Evangalist, we give a damn about everything we do, and that extends to something as seemingly minor as the emails we send. Successful messaging for a brand extends far beyond advertising or marketing collateral, and in our view includes smaller pieces of dialogue like emails or even the way stakeholders speak to one another. Great, persuasive, consistent messaging has to start from the inside out, which is why we encourage you to set guidelines and brand standards for interpersonal corporate communication. One small piece of messaging, like an email, can make the difference between an account growing or ceasing to exist.